Decathlon 2000 › News › Ashton Eaton going to break the world record again? There he is again, the man who makes it look all so easy to join in a combined event. Ashton Eaton as a young guy, freshly 22 years old broke first the heptathlon record in 2010 from another living legend. Dan O’Brien (6476 indeed the previous world record holder) was following that heptathlon at home. Before the start of the 1000 he called Harry Mara, Ashtons trainer, to ask Harry if his pupil would break his world record. “We all love you very much Obi” (O’Brien) he said “but at this moment we love the world record even more”! Ashton ran an astonishing 2:32.67 personal best and broke the record with a score of 6499 points. A new type of combined events athlete was born because sprinting (under 10.4 for a 100 meters or under 6.7 for a 60 meters) ánd running a 1000 or a 1500 at this level (world record level) is unseen before. Two years later on a rainy day and bad meteorological circumstances, Super-Eaton started a decathlon not knowing that he was going to perform, as well and as shining as he did those two days. He broke the magical record from that other superman Sebrle with 13 points. For some people not a nice number but easy to remember after having that 9026 for eleven years in your head as 13 points added makes 9039 and easy for the women pentathlon world record from Natalya Dobrynska (5013). Already in Talence he told me he wanted to try the 400 hurdles. Probably wanting to break the best time from a 7500 + athlete. Stephane Caristan (FRA 7570 points in 1992) performed at 48.86 for the long distance hurdles. We will see! Here are some other decathletes: Viktor Houston (BAR 7777/1997) 49.08/1998; Du’aine Ladejo (GBR 7635/1998) 49.29/2001; 8000+ : Jan Podebradsky (CZE 8314/2000) 49.66/1998; 8800+ : Daley Thompson (GBR 8847/1984) 52.14/1986. About a high jump and a world record! So back to Sopot! Is Ashton going to break the world record (6645) again? The only doubt we have, is how he’s going to perform in the high jump! Is that foot better? He explained a half a year ago that this was a very strange thing because it didn’t affect the rest of his training, but that the very specific move you make at your last step before you jump was hurting very badly. He also did not perform this winter in the high jump as well as in the 1000 meters. (The latter very normal). The other results are very promising: 60/6.69; LJ/7.58; SP/15.05 (indoor pb); 60 H/7.61 (1 hundredth from his pb) and the pole vault 5.35 – an all time best! Let us try to have a look at that one. Ashton said to specialize later in the pole vault. When his manager Piotr Buciarski – former pole vaulter and a national record holder in the discipline was asked what he expected in the pole vault from Eaton in the future, he said he can do 5.70 - 5.80 one day! Waaw! Said from a pole vaulter who participated in decathlon! (Some details: Piotr Buciarski (DEN/187/80/22-11-75) 7240/2002; Pb’s 11.12; 771; 12.81; 200; 49.79;; 15.87; 32.81; 575; 44.54; 4:52.95; Sum:7628 points). If Ashton performs with this year’s pb’s adding an 193 high jump to it, equaling his 1000 m pb and jumping 530, his points total turns out to be 6542; jumping 540 is 6557. Next combinations can be considerd to have an idea: 2014 pbs + 206/530/2:32.67 = 6645 (equal to the WR); 2014 pb’s + 203/ 540/2:32.67 = 6648. Yes, we know, combined events are unpredictable. 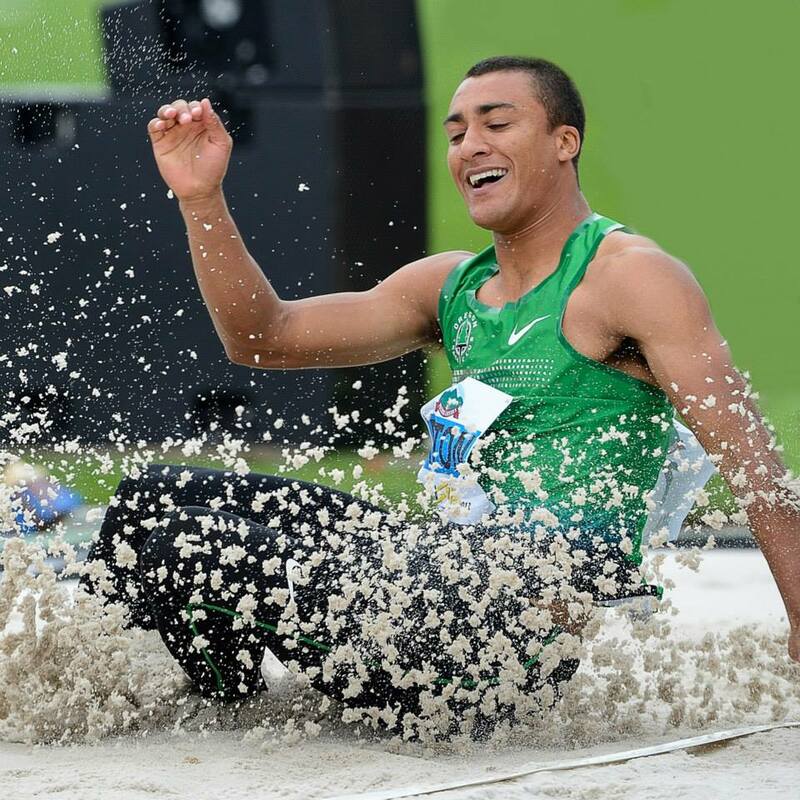 What we know is that Ashton Eaton is top favorite and as usual his aiming for a top score. But nothing may go wrong because there are hungry lions out there, hungry to eat gold, silver or bronze. At the end no one from this field can run like Eaton. Look also at the profiles of this athletes on Decathlon 2000 and read the pdf files from the previous article on Sopot 2014!